Spanish Treasury in Peru Account Book, 1571. (SPC) MSS BH 056 COCH. 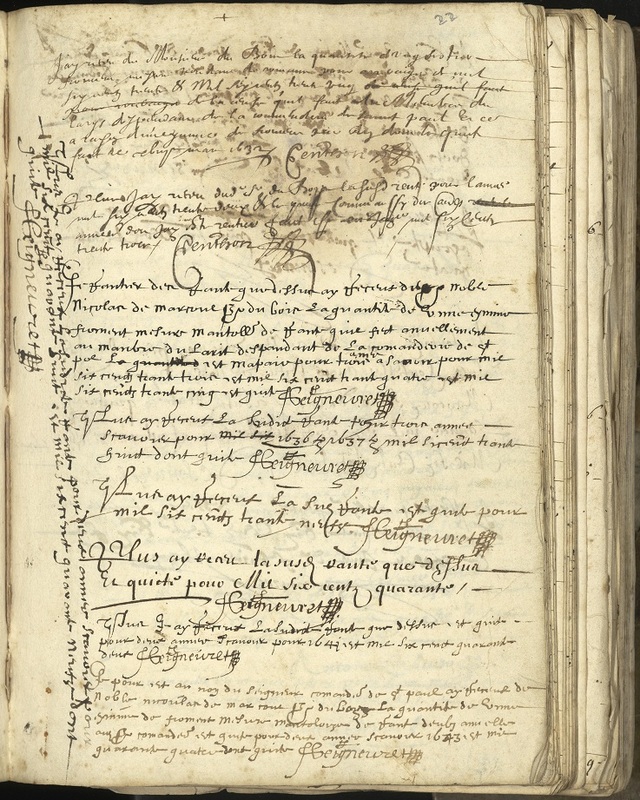 As part of the Philadelphia Area Consortium of Special Collections Libraries (PACSCL) project Bibliotheca Philadelphiensis, the Special Collections Research Center has been cataloging and digitizing its medieval and early modern collections, which include financial ledgers, notated music, a Book of Hours, and philosophical texts. While illuminated manuscripts are what immediately comes to mind when most people think of medieval manuscripts, Temple’s collections are a little different. 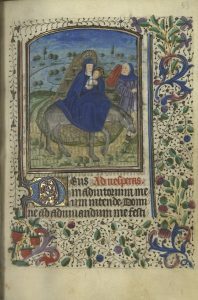 We do hold the beautiful Book of Hours: Use of Toul from the 15th century, but the bulk of our medieval and early modern manuscripts are financial or legal documents. While less artistically inclined, these manuscripts provide a glimpse into the everyday life of the period: how people held and transferred property, how businesses conducted their work, how banks managed their customers’ money, and how governments taxed their citizens. Banking Ledger, 1593-1595. (SPC) MSS BH 130 COCH. 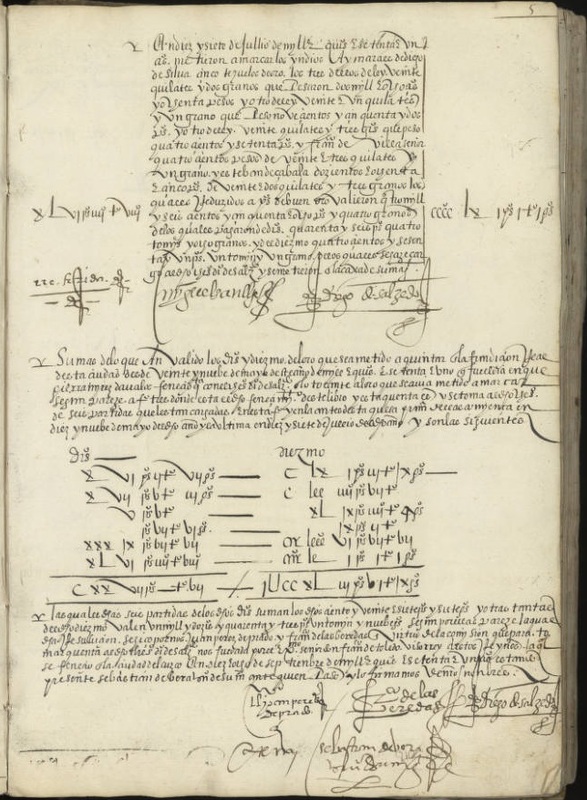 In that last category, the Spanish Treasury in Peru Account Book is a ledger maintained by the Royal Treasury of Peru in 1571, then under Spanish control. The volume records not only general revenue and expenses, but also the tributes forcibly levied against the native people whose land was colonized by Spain. 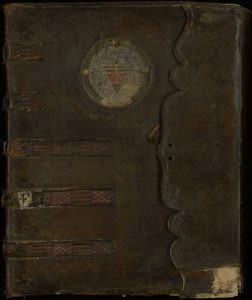 Another 16th century volume, an Italian Banking Ledger covering 1593-1595, is notable primarily for its extravagant binding and large size: over 19 inches tall. It contains debits and credits for a banking firm based in Rome. 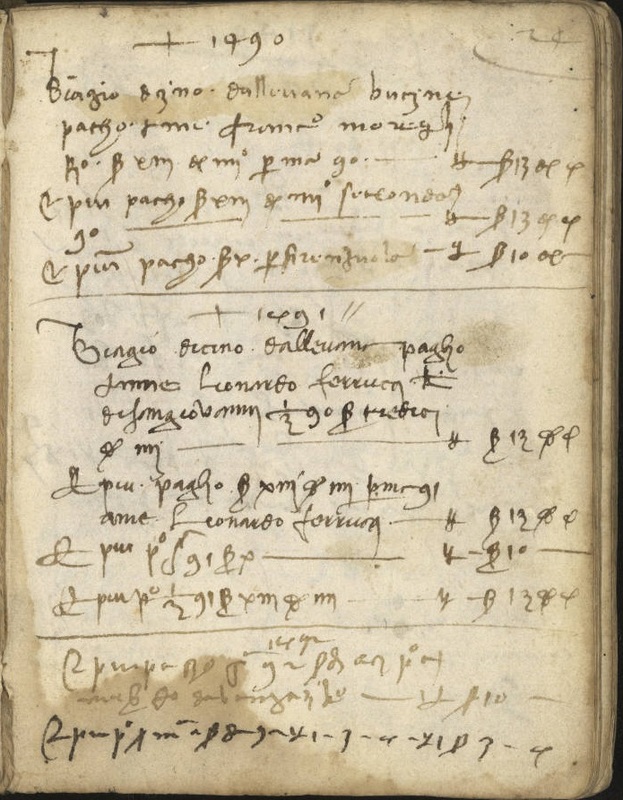 Florentine Grain Dealer Account Book, 1466-1524. (SPC) MSS BH 005 COCH. 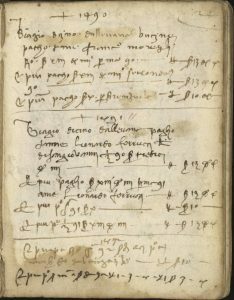 An earlier manuscript, the Florentine Grain Dealer Account Book, which covers the years 1466-1524, contains entries showing payments made for grain, rent, taxes, alms, and other income for this Italian business. The Marcoux Family Estate Account Book, which begins around the same time but continues into the 18th century, documents income for the estate, which was located in Dauphiné, France. The volume contains pages written right side up and upside down, as well as multiple paging conventions—perhaps to be expected in a ledger used for around three hundred years. Marcoux Family Estate Account book, 1488-approximately 1700-1799? SCRC 389 Cochran. These are just four of the finance-related manuscripts recently digitized for the project. All four belong to SCRC’s Harry C. Cochran History of Business Collection, which was established by Temple University Head Librarian Walter Hausdorfer in 1950. 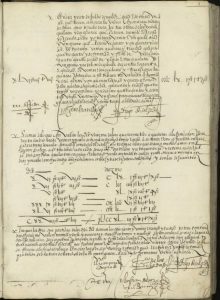 The Cochran Collection includes a wide range of manuscripts and a smaller number of books documenting the evolution of commerce in Europe and the Americas between the 4th and 20th centuries. The Bibliotheca Philadelphiensis project is funded by the Council on Library and Information Resources (CLIR), and aims to digitize and make available online medieval manuscripts from fifteen institutions in the Philadelphia area. Images and descriptive metadata will be released into the public domain and easily downloadable at high resolution via University of Pennsylvania Libraries’ OPenn manuscript portal. Temple is contributing nearly forty manuscripts to the project. SCRC’s digitized manuscripts are also being added to Temple’s Digital Collections website. 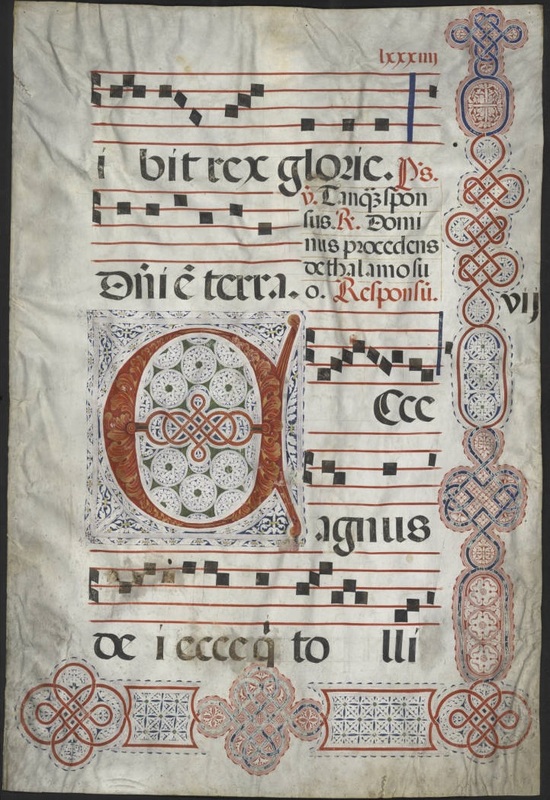 Antiphonary leaf, circa 16th century. SCRC 373. 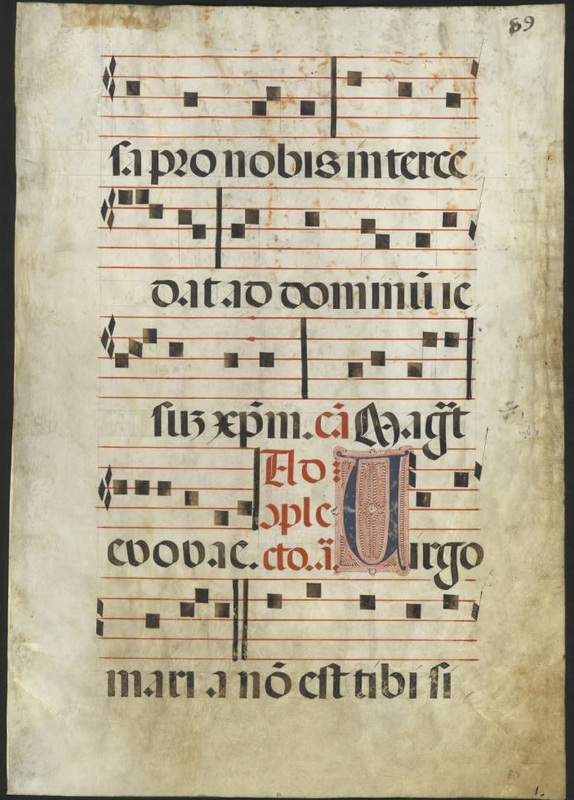 The Special Collections Research Center holds several leaves of medieval music, all of which have recently been digitized as part of the Philadelphia Area Consortium of Special Collections Libraries‘ (PACSCL) project Bibliotheca Philadelphiensis. The project is funded by the Council on Library and Information Resources (CLIR), and aims to digitize and make available online medieval manuscripts from fifteen institutions in the Philadelphia region. 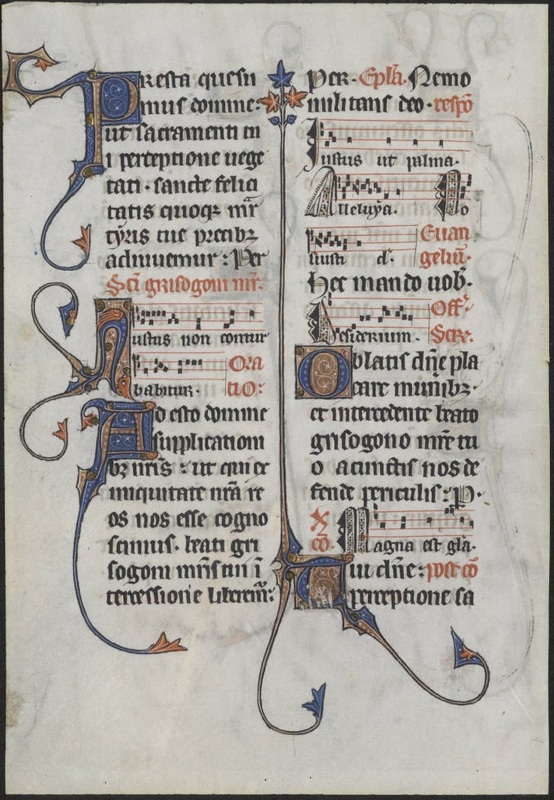 All of SCRC’s medieval music manuscripts are leaves, meaning single pages. Originally, these leaves would each have been one page in a larger bound volume. Practice in previous times was often to cut apart such volumes in order to sell the individual pages at higher prices–which meant that the context of the original item was lost. 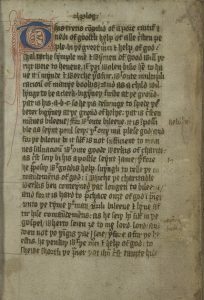 The practice did, however, allow libraries which might not have been able to afford an entire medieval manuscript volume to acquire an example in the form of a single page. The fate of the remainder of the volumes from which the SCRC leaves came is unknown. 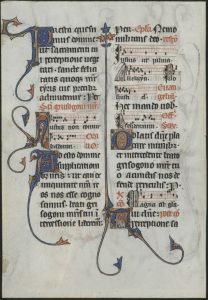 One benefit to digitizing dis-bound leaves is the possibility of one day finding their former companions and digitally reuniting the dismembered book, such as the project to reconstruct the Beauvais Missal. Spanish Antiphonary Leaf for the Feast of the Immaculate Conception, 16th century. SCRC 370. One leaf typical of SCRC’s holdings is from a 16th century Spanish antiphonary or choir book displaying a page of music with Latin text for the Feast of the Immaculate Conception. This leaf would have been bound in a huge volume—over 30 inches tall—originally used by the choir of Jaén Cathedral in southern Spain. 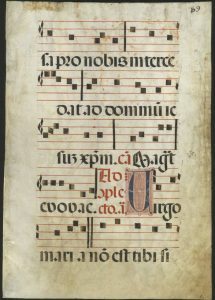 Antiphonaries were volumes containing the sung portions of the Divine Office and were intended to be placed in front of the choir for reference, hence their large size. 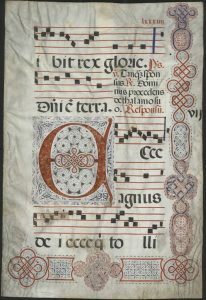 SCRC holds several antiphonary leaves, all presumed to be from Spain. 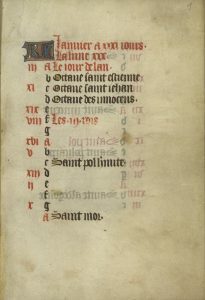 French Missal Leaf, 1285. SCRC 368. A French missal leaf from 1285 is an outlier in size at only a little over 7.5 inches tall. A missal is a liturgical book containing the texts necessary for the celebration of the Mass. 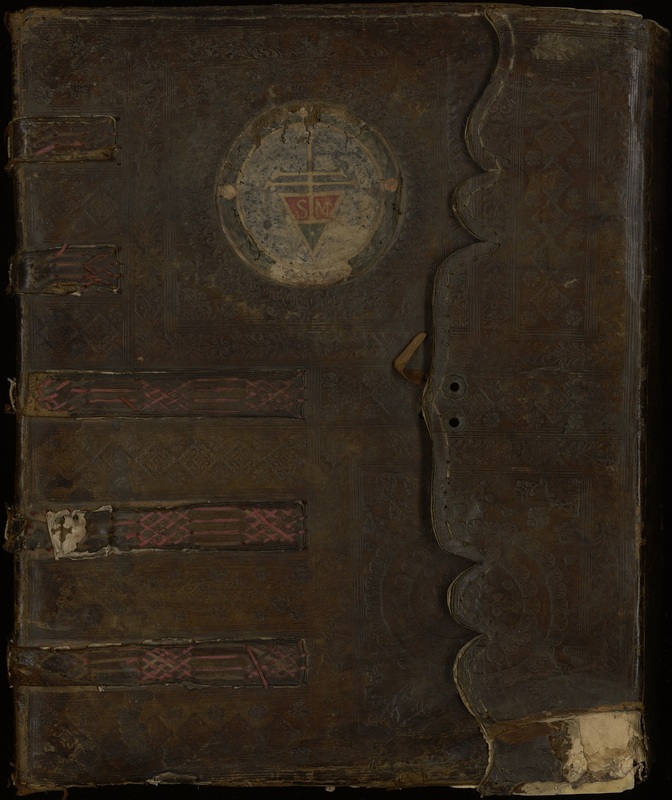 All images and descriptive metadata for manuscripts in the Bibliotheca Philadelphiensis project will be released into the public domain, easily downloadable at high resolution via University of Pennsylvania Libraries’ OPenn manuscript portal. Temple is contributing nearly forty manuscripts to the project. SCRC’s digitized manuscripts are also being added to Temple’s Digital Collections website. 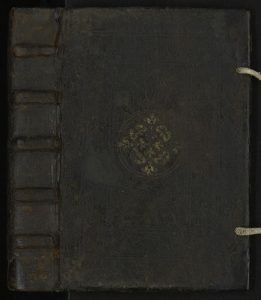 16th century binding. Pore Caitiff, [14–]. (SPC) MSS LT 085. Special Collections Research Center. The Special Collections Research Center holds a number of medieval manuscripts of various types, including financial ledgers, notated music, a Book of Hours, and philosophical texts. 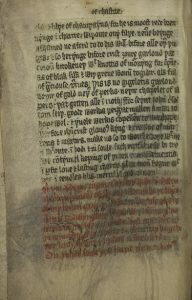 One interesting volume in the collection is a manuscript of the “Pore Caitif,” a late 14th and 15th century devotional text consisting of tracts intended for home use by the laity. 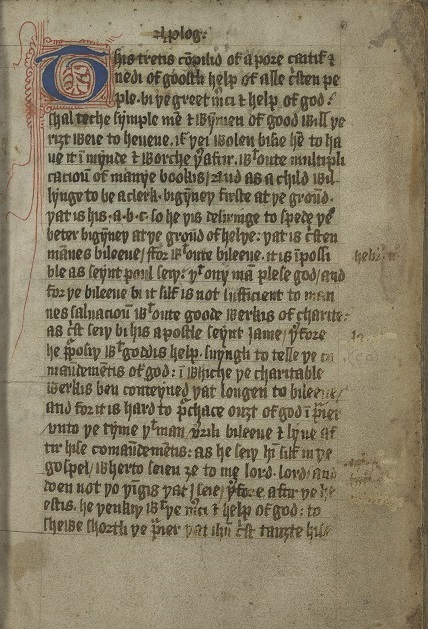 The compilation of this handbook for religious instruction is most frequently attributed to English reformer John Wycliffe (1330 – 1384), and it contains approximately fourteen tracts intended to teach the reader about the Ten Commandments, the Paternoster, the Creed, and other basic aspects of Christianity. The number of Pore Caitif manuscripts in existence–more than fifty–demonstrates that this text was extremely popular during this time period. First page of text. 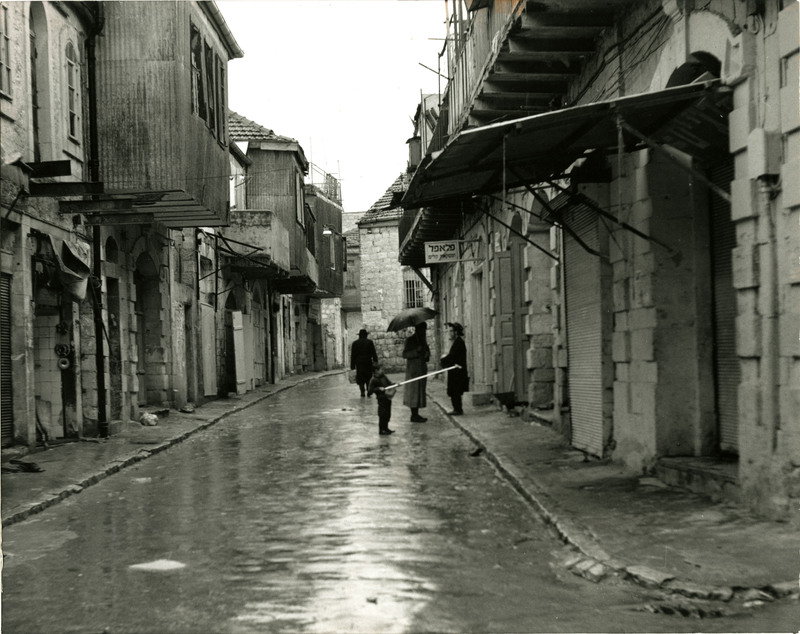 Pore Caitiff, [14–]. (SPC) MSS LT 085. Special Collections Research Center. Temple’s Pore Caitif dates from the 14th century. 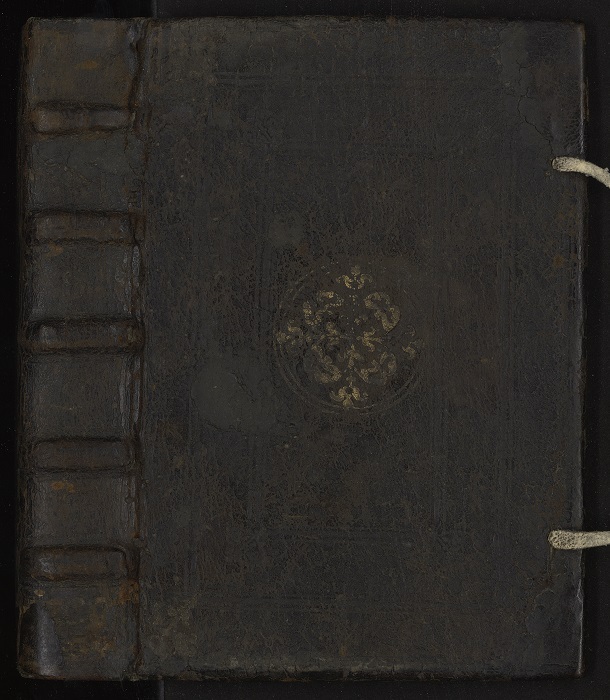 It has a later binding from the 16th century, made of black Moroccan leather, and contains the bookplate of Robert R. Dearden, a 20th century Philadelphia book collector. 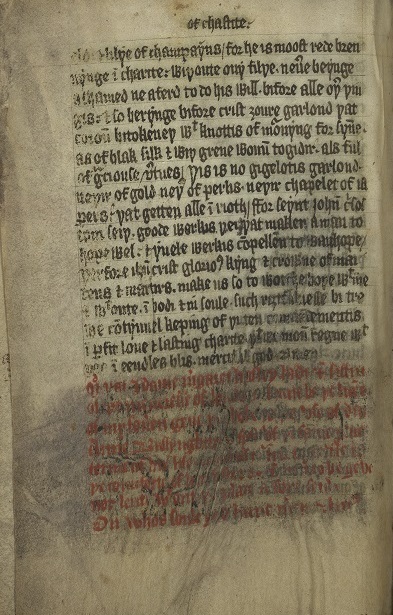 An inscription on the last pages of the manuscript indicates that Dame Margaret Hasley, a sister in the Order of Minoresses, presented this work to another sister. Last page of text. Inscription in red states that Margaret Hasley presented the volume to another sister in the Order of Minoresses. Pore Caitiff, [14–]. (SPC) MSS LT 085. Special Collections Research Center. 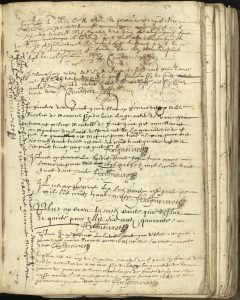 The volume was recently digitized for the Bibliotheca Philadelphiensis project, funded by the Council on Library and Information Resources (CLIR) and sponsored by the Philadelphia Area Consortium of Special Collections Libraries (PACSCL). The project aims to digitize and make available online medieval manuscripts from fifteen institutions in the Philadelphia area. Images and descriptive metadata will be released into the public domain and easily downloadable at high resolution via University of Pennsylvania Libraries’ OPenn manuscript portal. Temple is contributing over twenty manuscripts to the project. 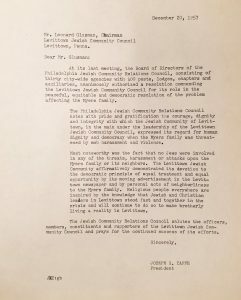 The Jewish Community Relations Council of Greater Philadelphia (JCRC) was established by B’nai B’rith in January 1939, but was originally known as the Philadelphia Anti-Defamation Council (PADC). The organization changed its name in May 1944, to better reflect its dual mission to fight anti-Semitism and organized bigotry, as well as to promote intergroup understanding and cooperation. 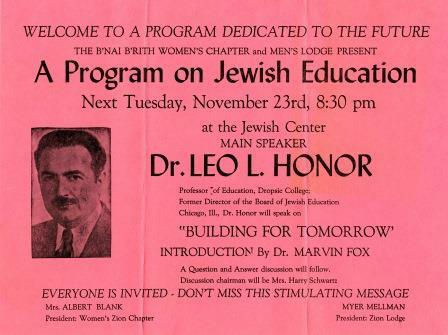 Although the JCRC developed into an organization that worked to advance both of these goals, the earliest records show their focusfrom 1939 through the end of the Second World War was on investigating and combatting anti-Semitism. 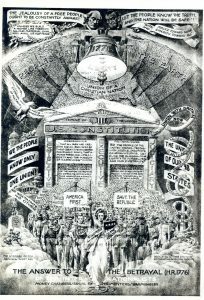 Prior to the Japanese attack on Pearl Harbor in December 1941, conspiratorial ideas regarding Jews increasingly became intermixed with an isolationist and nativist sentiment that hoped to keep America strictly neutral in the growing conflict in Europe and Asia. 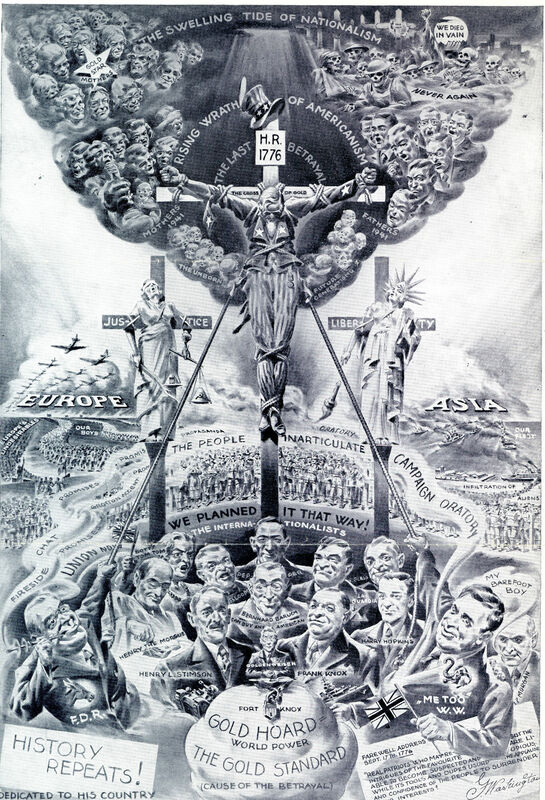 A graphic example of this came to the attention of the PADC on April 17, 1941. 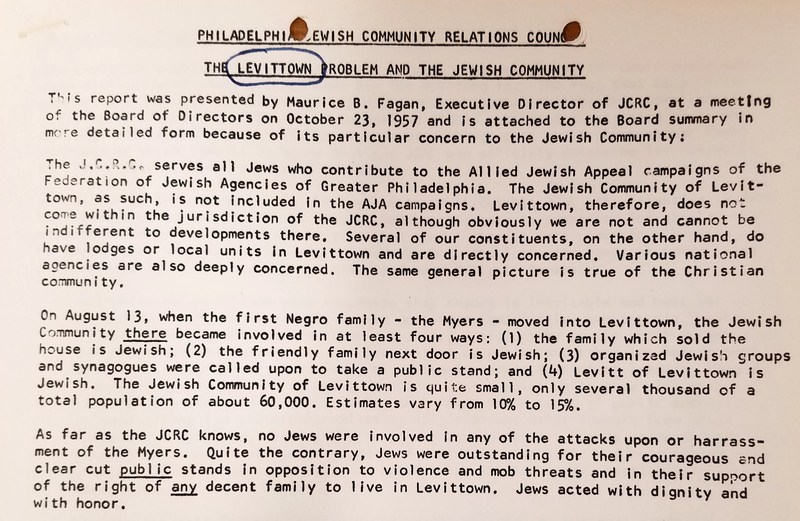 Initially referred to as the “new pro-Nazi circular,” correspondence shows that Maurice Fagan, executive director of the PADC, was in contact with the Anti-Defamation League (ADL) and other groups who were investigating its appearance in Philadelphia. An ADL contact revealed that a large number of these circulars were sent to “H. L. Smith” of 2218 Pine Street by “M. Slauter” of 715 Aldine Ave., Chicago. 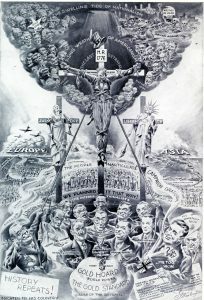 A few days later, Fagan learned that the “Uncle Sam crucifixion circular” was the “brain child” of Newton Jenkins of Chicago and that there were reports of the circular appearing in Oregon and New York. 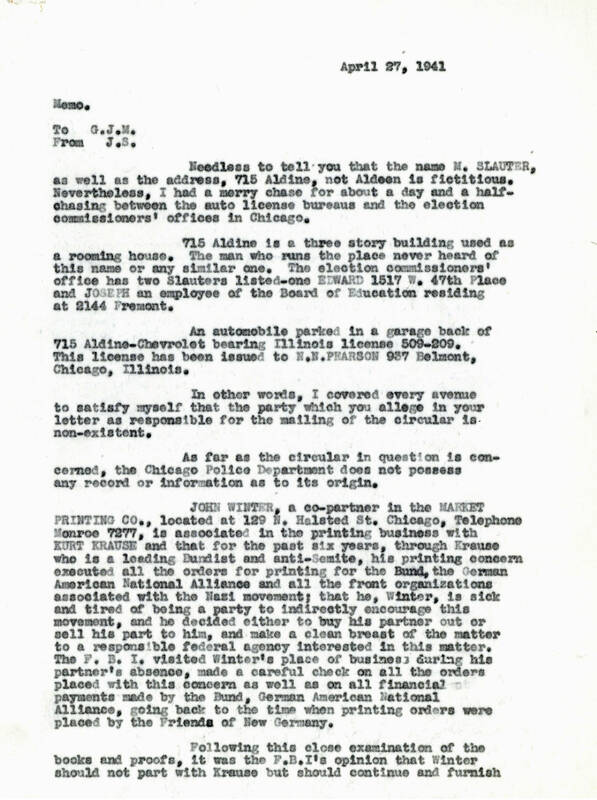 A memorandum from April 24, described 715 Aldine Ave. as a “clearinghouse for anti-Semitic material” and connected Newton Jenkins with Elizabeth Dilling, a right-wing activist and supporter of isolationism. 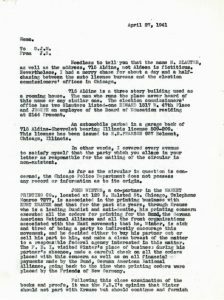 On May 29, Maurice Fagan sent a letter to the Philadelphia office of the F.B.I. with an update on the investigation into the circulars. 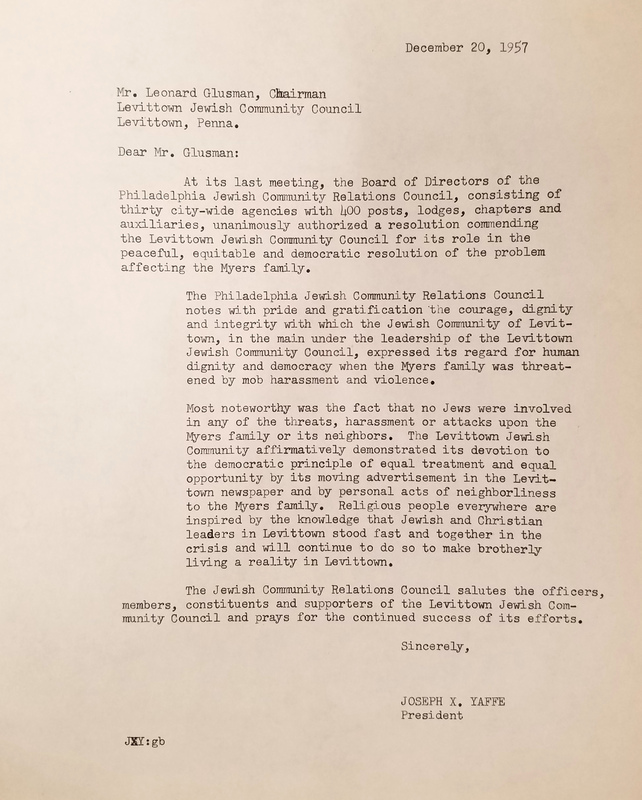 This letter appears to be the last action taken on this case, but the records of the JCRC contain many other examples of PADC investigating and exposing cases of anti-Semitism in the Greater Philadelphia region. This is the third post of an occasional series highlighting the work of Philadelphia’s Jewish Community Relations Council (JCRC). The records of the JCRC, housed in Temple University Libraries’ Special Collections Research Center, are currently being processed and will be available for research in 2018. First page of the calendar. 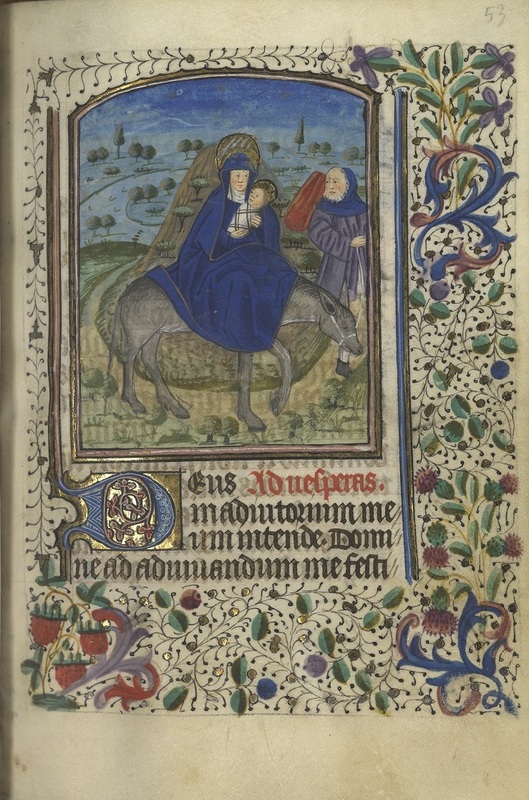 Book of Hours: Use of Toul, between 1450 and 1499. The Special Collections Research Center is fortunate to hold two Books of Hours from the fifteenth and sixteenth centuries in its collection. Looking at these two volumes side by side, visitors to the SCRC can see for themselves the transition from the manuscript tradition to the printing tradition during the early years of the printing press. 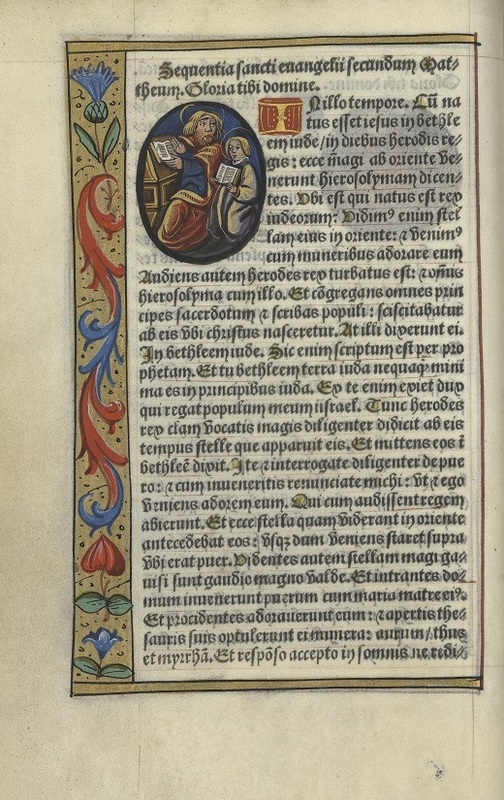 Books of Hours were generally created during the fourteenth through sixteenth centuries, and contain prayers dedicated to the Virgin Mary to be read throughout the day. These prayer books were intended to aid personal prayer rather than public worship in a church or cathedral. Books of Hours were enormously popular with the middle class of the day, and even today are the most common type of book or manuscript remaining from the medieval period. For more information on books of hours, see the tutorial on the Les Enluminures web site. From the Gospel of Matthew. Ces presentes heures sont a lusaige de Ro[m]me toutes au long sans require. Ont este imprimees nouuellement a Paris. : Par Germaine Hardouyn demourant audict lieu: Entre les deux portes du Palais: A lenseigne Saincte Marguerite, . SCRC’s manuscript book of hours is thought to be from Toul, France (Book of Hours: Use of Toul), and dates from between 1450 and 1499. It is written on parchment, which is made from animal skin, and it contains hand painted miniatures. As a manuscript, it is a unique item. The printed Book of Hours (Ces presentes heures sont a lusaige de Ro[m]me, or Book of Hours: Use of Rome), printed in Paris around 1534 by Germain Hardouyn, contains metalcuts hand painted by artist Jean Pichore. It is printed on vellum, which is a finer quality parchment made from the skin of a calf or other young animal. This volume is believed to be one of only three remaining copies of this edition. Planetary Man. Ces presentes heures sont a lusaige de Ro[m]me toutes au long sans require. Ont este imprimees nouuellement a Paris. : Par Germaine Hardouyn demourant audict lieu: Entre les deux portes du Palais: A lenseigne Saincte Marguerite, . 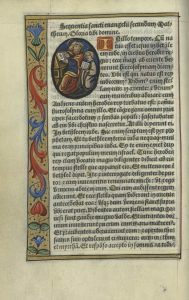 The manuscript Book of Hours was recently digitized for Bibliotheca Philadelphiensis a Philadelphia Area Consortium of Special Collections Libraries (PACSCL) project, funded by the Council on Library and Information Resources (CLIR) . The project aims to digitize and make available online medieval manuscripts from fifteen institutions in the Philadelphia area. 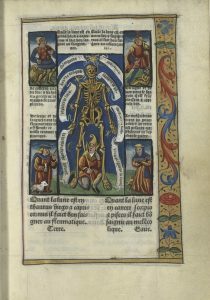 Images and descriptive metadata will be released into the public domain and easily downloadable at high resolution via University of Pennsylvania Libraries’ OPenn manuscript portal. Temple is contributing over twenty manuscripts to the project. On August 13, 1957, William and Daisy Myers and their three children, an African American family, moved into the all-white community of Levittown, Pennsylvania, and shortly thereafter found themselves confronted by angry residents displeased with their arrival. Large crowds gathered during the day and hurled insults towards the home, while at night, cars drove by flashing their lights and honking their horns. The situation escalated over the course of eight days, with rocks being thrown through the windows of the Myers’ home and another stone knocking a local police officer unconscious. In response, the Pennsylvania State Police were sent to Levittown to restore order, where they would remain for nearly two months before a semblance of calm returned. 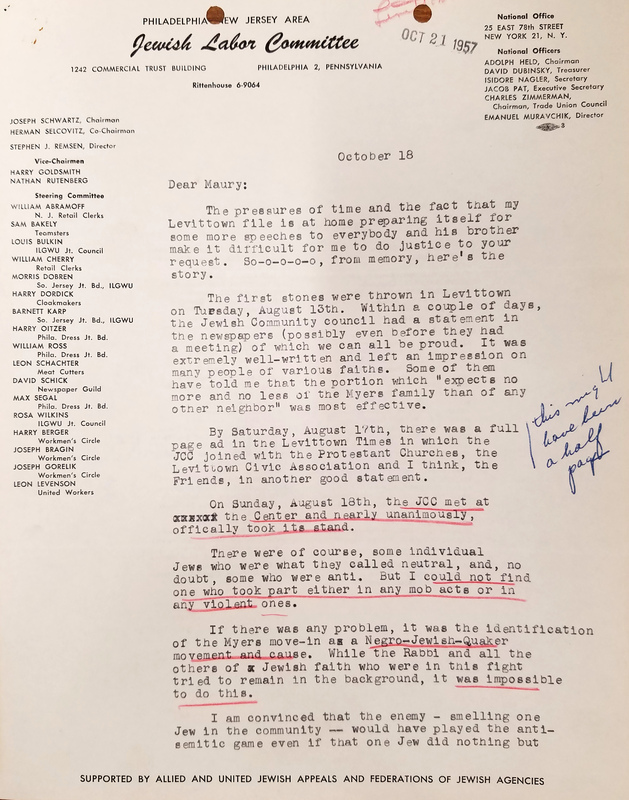 The apparent request was for an account of the role of Levittown’s Jews in response to the unrest. The letter praises the activities of the local Jewish Community Council, which worked in cooperation with Protestant and Quaker groups to actively support the rights of the Myers. Remsen notes that there were some “individual” Jews who were either neutral or opposed to the racial integration of their community, yet also stresses that he could find no evidence that any Jew took part in any of the protests or acts of mob violence. 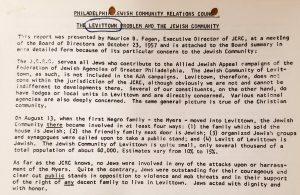 Perhaps the most interesting comments in the letter come when Remsen expresses concern to Fagan about the way Jews are sometimes perceived and how this could influence events in Levittown. The events that took place in Levittown, Pennsylvania, are a small chapter in the larger story of American’s struggle over civil rights, but in many ways it represents themes that would reverberate in numerous communities across the country. While not all Jews took up the fight against segregation, in many cases American Jews could be found either on the front lines or working to support the efforts of those who were. 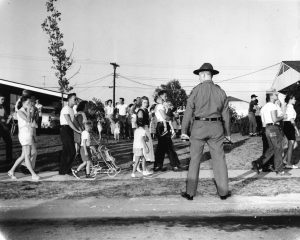 Additional photographs of crowds protesting the Meyers’ family move to Levittown, PA, can be found in the Philadelphia Evening Bulletin photograph collection. To learn more about the Levittown communities in Pennsylvania and New Jersey, see Suzanne Lashner Dadyanim’s essay on The Encyclopedia of Greater Philadelphia’s website. This is the first post of an occasional series highlighting the work of Philadelphia’s Jewish Community Relations Council (JCRC). The records of the JCRC, housed in Temple University Libraries’ Special Collections Research Center, are currently being processed and will be available for research in early 2018. From An Historical Essay Concerning Witchcraft…. 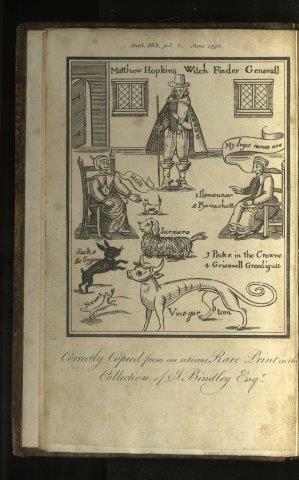 This illustration is “Matthew Hopkins Witchfinder general,” a 1793 reproduction of a well-known 1647 woodcut. The image was inserted as a frontispiece in the book after its publication. Philip Gardiner Nordell (1894-1976), graduated from Dartmouth College in 1916, where he was an All-American in the running broad jump. He claimed to have invented the predecessor to boxed cake mixes in the 1920s—founding a business that combined the dry ingredients for muffins, allowing the baker to simply add water. Nordell’s primary research interest was early American lotteries, which he studied for over thirty years. His personal collection of early lottery tickets and related newspaper announcements, brochures, and broadsides, is now at Princeton University. Nordell also assembled an extraordinary collection of books documenting religion, politics, and science in Britain and New England in the 17th and 18th centuries. Temple Special Collections acquired this collection from Nordell in 1965. It contains more than 250 books, including a significant number of rare British and American imprints on religion from the 17th and 18th centuries. The collection documents the predominant and often conflicting ideas during this period, particularly related to religion, religious liberty, and rationalism in England and the New England colonies. Included in the collection are many books on “fringe” groups, such as Anabaptists, Levellers, Ranters, and atheists, as well as many works on witchcraft. Authors represented include Francis Bacon, John Cotton, Thomas Edwards, Joseph Glanvill, Thomas Hobbes, John Lilburne, Cotton Mather, and William Prynne. Of particular interest are the books on witchcraft which represent a very comprehensive view of the topic. 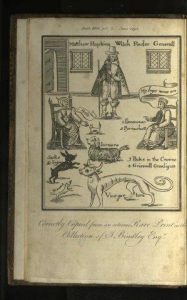 Originating on both sides of the Atlantic, they document the conversation that old and new worlds were having about sources, causes, and cures for witchcraft–and the eventual repudiation of the belief that witches exist. Since the late 1940s, Philadelphian Philip Taylor has been taking photographs of his environment—Philadelphia as it was in the intervening decades. 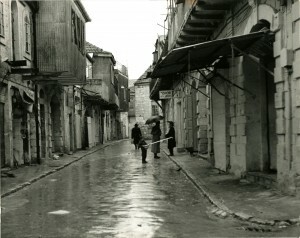 His painstakingly-processed silver gelatin prints illuminate Walt Whitman Bridge construction, the homeless, pre-gentrification Society Hill, the Camac baths, the Philadelphia neighborhoods of South Philadelphia, Northeast Philadelphia, and East Poplar, Atlantic City, and Philadelphia residents—both anonymous and famous—as well as his travels to Israel, the Canary Islands, and Cuba. Philip Taylor attended local public schools in South Philadelphia. In 1943, during his junior year in high school, he dropped out to help support his family after his father died suddenly while working at the Philadelphia Navy Yard. Taylor worked as a civilian in the Navy Department in Center City Philadelphia—in the mail room located next to the photography department. Drafted into the United States Army in 1944, Taylor served until 1946 at various stateside bases. After the war, Taylor apprenticed as a union tradesman in the lithographic printing industry in Philadelphia. For the next twenty-five years, he worked the night shift as a master lithographic cameraman making half-tone negatives and color separations for the print medium at Mid-City Press, one of the largest commercial printers in Philadelphia. 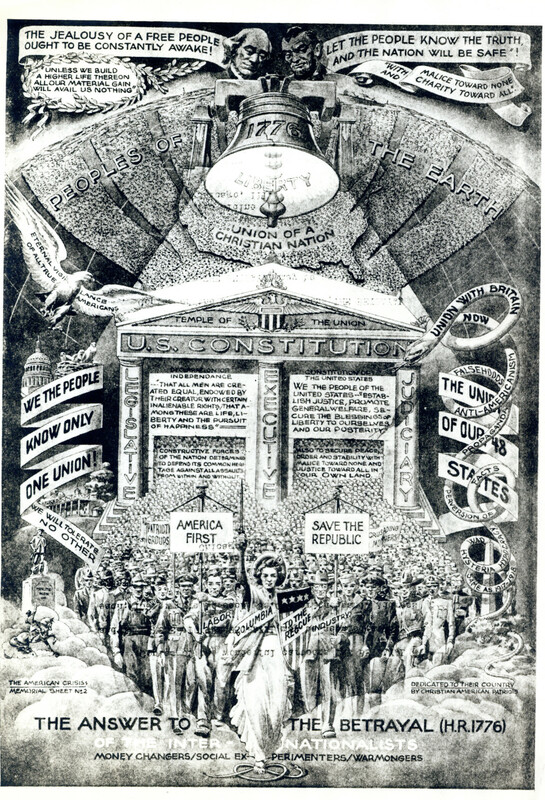 Taylor also taught at the Philadelphia Lithographic Institute and holds two United States Government patents, one in the medical field and another in the lithographic field. He also invented two devices related to the lithographic printing industry. Working full time, Taylor photographed his environment using a Rolleiflex 3.5F TLR camera and a Leica 35mm camera, and frequently stayed up until dawn developing negatives into photographic prints. Temple University Libraries are grateful to Mr. Taylor for his donation of his life’s work. It will serve as a resource in the Special Collections Research Center for study and research. Please join us for a reception celebrating his work, February 26, 4:00 – 7:00, Paley Library Lecture Hall. The exhibit is on view on the ground and first floors and mezzanine of Paley through August 2016. The Special Collections Research Center (SCRC) at Temple University Libraries is pleased to announce that the Franklin H. Littell collection is open and available for research. 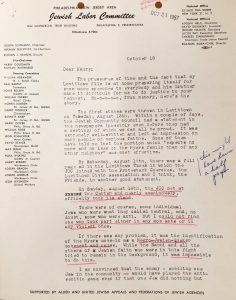 View the finding aid on the Libraries’ website, along with portions of the papers which have been digitized. Dr. Littell’s extensive library is cataloged and is available for use along with the papers in the SCRC reading room on the Ground Floor of Paley Library. Franklin Littell (1917-2009), emeritus professor of religion at Temple University, led a distinguished career that spanned more than seventy years. He was a pacifist and activist, proponent of the Christian Laity and an advocate for new religious movements, an historian, political commentator and supporter of the State of Israel. 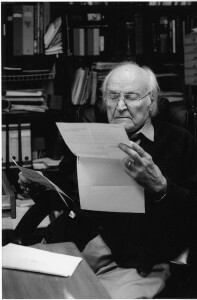 He devoted ten years to work with the Protestant Churches and Laity in US-occupied Germany and more than fifty years to the study and remembrance of the Holocaust and German Church Struggle. He career is marked by strong beliefs in interfaith understanding and religious liberty. The Littell and Sachs families donated Dr. Littell’s papers and library to Temple in 2010, where they were the focus of a three-year cataloging and processing project. Processing of the collection was funded through a grant from the Conference on Jewish Material Claims Against Germany, Inc., and generous support from Norman Braman. The Leo L. Honor Papers, a recently processed collection now open for research, is one of a few collections in the SCRC that document the growth of Jewish education in Philadelphia in the twentieth century. Dr. Leo Lazarus Honor was an educator who for much of his career taught Jewish teachers how to teach, and, in the process, mentored a generation of Jewish educators. Dr. Honor was an advocate for religious education and believed that an engaging curriculum of Jewish studies would encourage young people to identify with their heritage from an early age. Honor was well known for emphasizing religious education based on unity, rather than uniformity. His dedication to the Jewish teaching profession and his inclusive approach to religious education made Honor a leading and well-respected Jewish educator.